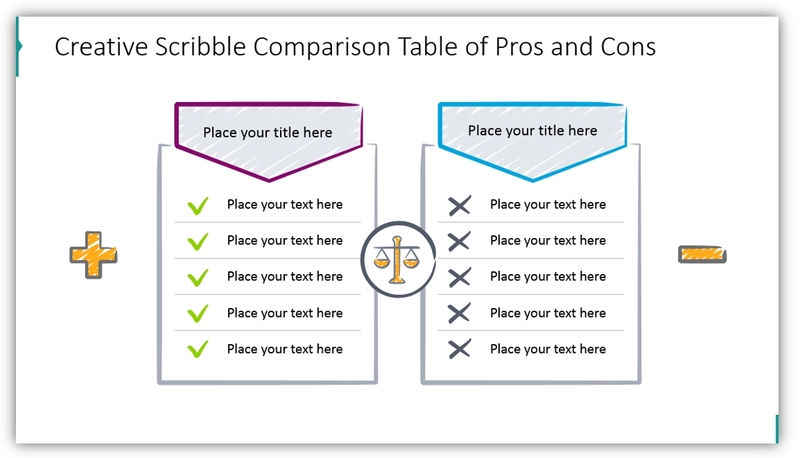 If you want to create a winning presentation, you should use less text and more visual content, especially if you are going to compare the pros and cons of one or a few items. The great news is that you don’t need to be an expert in graphic design to create catchy slides. 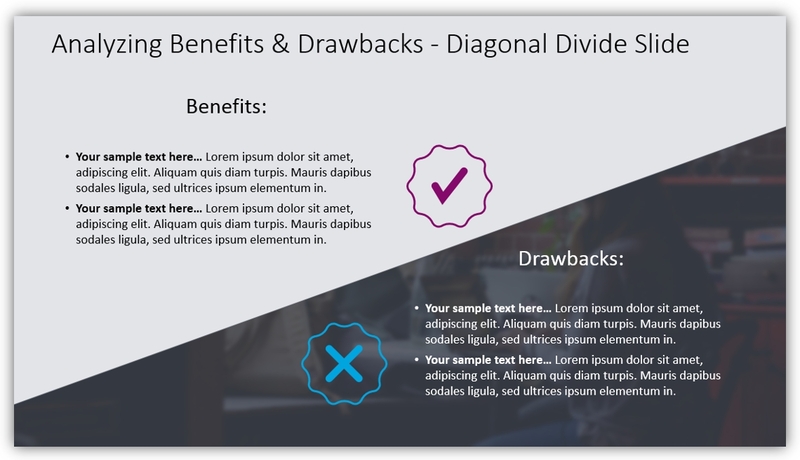 Do you have any ideas on how to create a visually appealing Pros & Cons slide? If your answer is ‘no’, don’t hesitate to check the following unordinary slide design ideas. They are fresh, simple, and elegant. It’s likely that they will fit your presentation. Note: All example slides below are accessible in Pros & Cons PPT Diagrams Comparison Charts (see details by clicking the pictures). 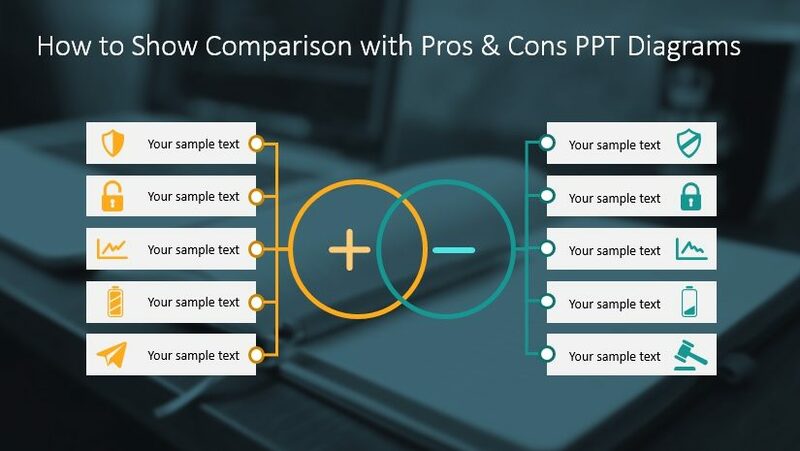 Why Use Pros and Cons Diagrams in Your Presentation? • Highlight the major advantages and disadvantages of the product, process, strategy, etc. • Compare and contrast pluses and minuses of two or more items. • Replace ordinary tables with creative diagrams. • Substitute traditional bulleted list with visually appealing infographics. Are you going to use ordinary bullet points to list the advantages or disadvantages of the discussed subject? It would be better to visualize data to make sure that your audience will not miss any critical information. 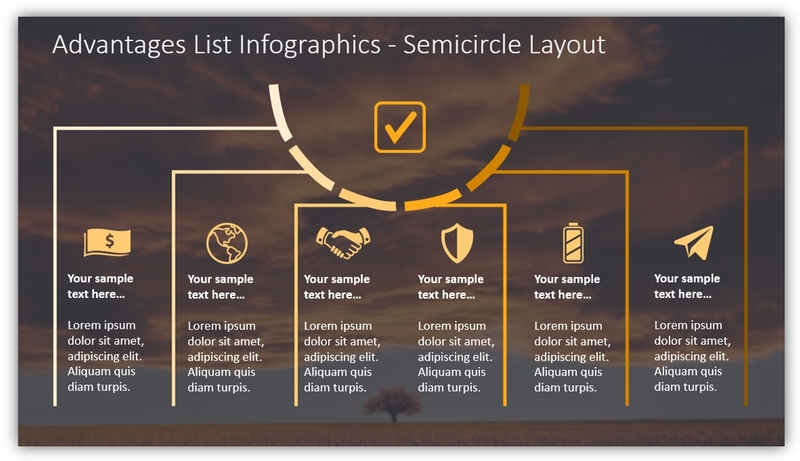 Take a look at the following example, which demonstrates how you can transform a written list of the advantages in the eye-catching infographic. You can add different icons and short descriptions to draw your audience’s attention to small details, which matter. Check the following template, which shows how you can highlight Pluses and Minuses utilizing non-standard tables. We also added hand drawn icons and elements to make the table look creative and unique. In case you want to discuss the advantages of the item in more details but don’t want to overload slide with text, you can choose the following design. A relevant background photo and a small text section work great together. Visualization of this type makes your message clear and concise helping to retain the audience’s attention. You can also apply this design to list the disadvantages. 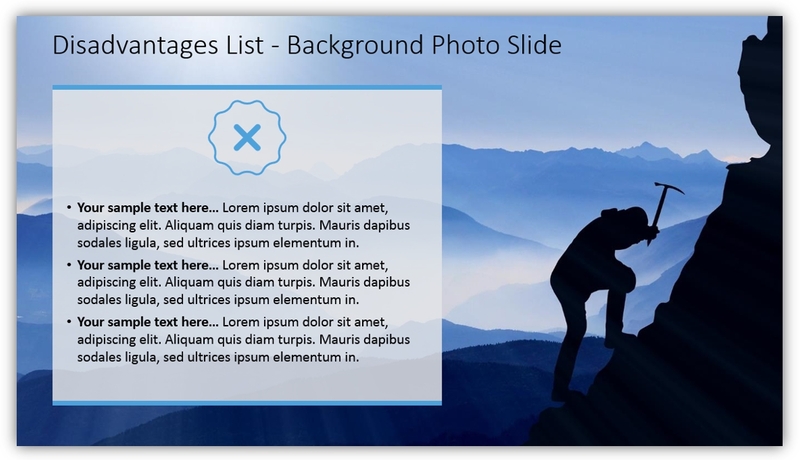 Take a look at the following template: high-resolution image pairs well with a short bulleted list and a few simple icons. Take a glance at the following template, which presents benefits and drawbacks in a simple, yet effective way. 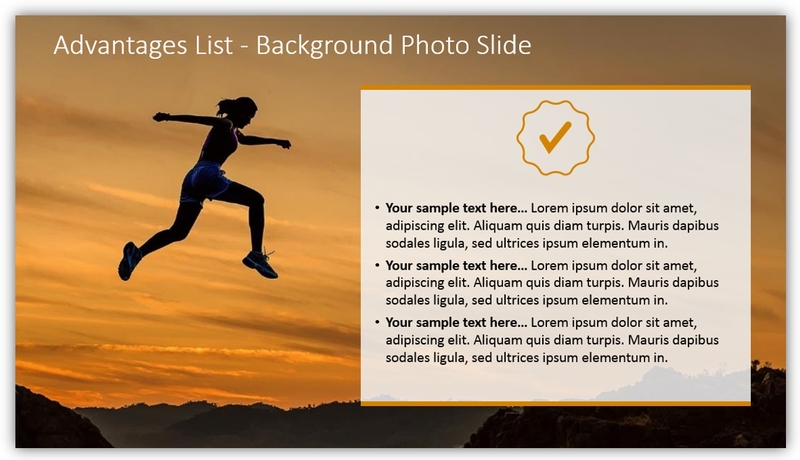 The slide divided diagonally looks more creative and will suit any presentation. You can add big icons (like on the picture) to show where you stated benefits and drawbacks. As you can see, there are a lot of unordinary Pros and Cons slide designs to choose from. Your task is to select the most suitable diagram to create a killer presentation. To save you time developing such comparison tables visuals we designed an editable PowerPoint template with various comparison slide examples that can help you to present an evaluation of product pluses and minuses, list advantages and disadvantages of a solution or a decision. Go and create engaging infographics. You can also check flat infographics collection to add more variety to your slides or any other documents. Author: Leona Henryson – freelance writer and UX designer. Also, she is a contributing writer for various blogs. When she is not writing or designing, she is swimming, hiking, and, weather permitting, snowboarding.